Georg Jensen Silver and Wedgwood Ceramics Highlight Skinner Auction | Skinner Inc.
Skinner is pleased to offer Milikins Collection of Wedgwood. Jeffrey Milikins began collecting while a graduate student in New York City. 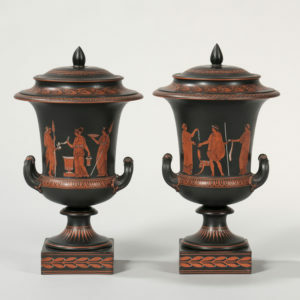 His collecting tastes span 250 years of Wedgwood production with a particular interest for encaustic decorated pieces of which a Pair of Wedgwood Encaustic Decorated Krater Vases and Covers (Lot 68, Estimate: $5,000-7,000) are a fine example. Also from the collection are a Pair of Wedgwood Black Basalt Faun and Bacchante Figures (Lot 49, Estimate: $4,000-6,000). Jeff was active in the Wedgwood International Seminar and the Wedgwood Society and it is timely that the sale of his collection coincides with the 2019 WIS in Salem, MA. An impressive group of holloware and flatware by Georg Jensen with some early examples including a full blossom pattern tea service (Lot 366, Estimate: $10,000-15,000) and a rare pair of candelabras (Lot 368, Estimate: $5,000-10,000) lead the selection of over 100 lots of silver for the home. Other highlights include a Pair of Victorian Britannia Standard Silver Pilgrim Flasks, London, 1892-93, George Fox, maker (Lot 336, Estimate: $10,000-15,000), with the design closely related to the design of the 1710 pilgrim flask by Pierre Platel (1659-1719), currently in the collection of the Victoria and Albert Museum, London (museum no. M.854&:2-1927). A larger example of this same form was exhibited at the 1862 International Exhibition in London (Sotheby’s Sale L12303, July 8, 2015 lot 8). 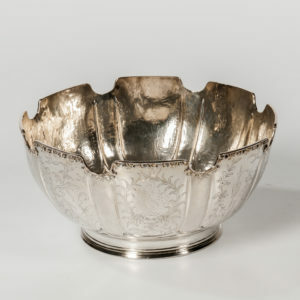 Another highlight is a James II Sterling Silver Monteith, London, 1685-86, George Garthorne, maker, sold by the Museum of Fine Arts, Boston, for the benefit of the collection (Lot 319, Estimate: $15,000-30,000). 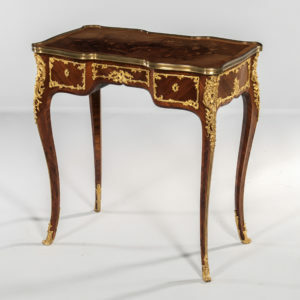 A wide range of British and European antique and period-style furnishings and decorations including artwork and carpets are on offer with a group of Dutch floral marquetry furniture with a Dutch Walnut-veneered Marquetry Secretary Bookcase (Lot 485, Estimate: $800-1000) a Louis XV-style Ormolu-mounted Kingwood- and Tulipwood-Veneered Desk (Lot 603, Estimate: $4,000-6,000) and a group of decorative sculpture including the bronze Tigre Devorant un Gavial after Antoine-Louis Barye (Lot 529, Estimate: $4,00-6,000). Previews for the auction will be held on April 11, from 12PM-5PM and April 12, from 12PM-8PM. Free and open to the public, specialists will be on hand to answer questions. Auction catalogs may be purchased at www.skinnerinc.com. This entry was posted in News and tagged American silver, european antiques, european art, european auction, European ceramics, european clocks, European decorative arts, european furniture, European porcelain, European silver, Louis XV-style, wedgwood by Skinner. Bookmark the permalink.